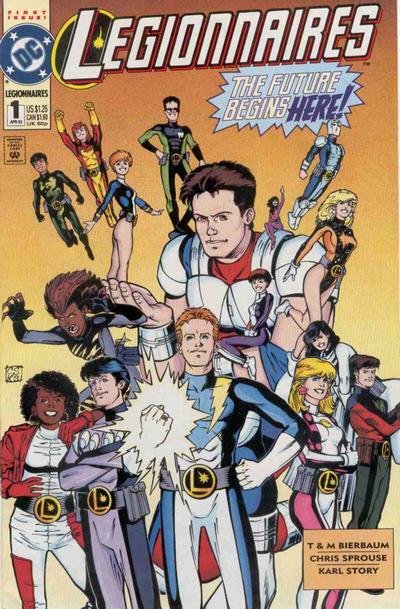 In 1988 a new Legion spinoff was planned, featuring new characters, the 20th century version of the Legion. I was asked to design the logo for L.E.G.I.O.N. ’89. Frankly, I hate acronyms with periods after each letter, and my first challenge was finding a way to make the periods work in a logo without forcing the letters to become too spread apart. My solution was to use letterforms that were wider at the top, each with an inward jog on the left side. The narrow periods and the wider tops kept everything close together. The letter shapes were suggested by fonts I used to see on computer forms and checks that had equally odd shapes to make them read better on a computer scanner, I guess. The ’89 hung below at an angle. Usually I did logo sketches in marker, but this one was in tight pencil, as seen above. I think it’s the only sketch I submitted, as I couldn’t think of another way to make those periods work, and it was accepted without changes. …and the cover of the first issue, where I think the logo worked particularly well as a poster title. One thing none of us thought of was what would happen if the book was successful enough to continue beyond 1989. And so, every year through 1994 I had to do another “year” to append to the logo. Call it a small bit of job security. 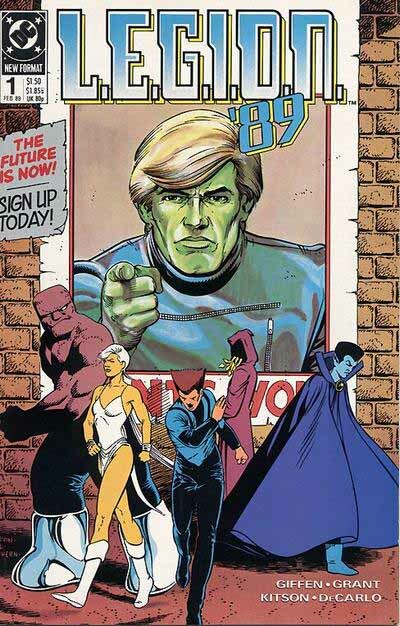 In 1989 the main Legion book ended temporarily to make way for a reboot of the series by Keith Giffen, with writers Tom and Mary Bierbaum. He planned a “five years later” story of a grim postwar group barely hanging on, and would gradually reveal how they got there. A new logo for this relaunch was commissioned from Steve Vance, a California designer and comics artist, who has graciously agreed to share some of his design work with us. Steve did these versions on the computer, in Adobe Illustrator, and reports it was one of the first logos he did that way. Steve told me his main direction from DC was to emphasize LEGION and diminish OF SUPER-HEROES, which he’s certainly done here. An interesting layout, very square, which might have been a nice departure for the title. Note that on many of these, the bottom line is standard sans-serif type. This one is also very tall, but slanted and without the box. The thin letters and drop shadow make it a bit hard to read in black and white, though that probably wouldn’t have been true with color added. I do think the type in the bottom box is too close to the box, though. Another tall, square layout that I think has a quite original approach. I like the small openings in only parts of the tall letters. This might have needed a box around it to read against some cover art. 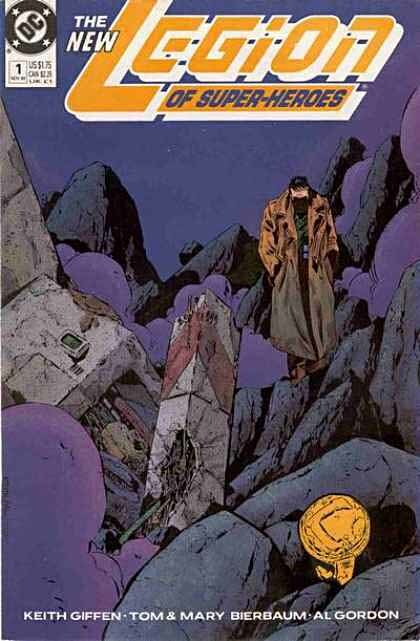 And all these very tall logos would have needed to be worked into the cover art designs by Giffen. They’re not the usual comics logo shape. But, if that was done, it might have been an interesting departure. This version is more of a standard comics logo shape and style. I like the letterforms a lot, and the small serifs add interest. I think if I were choosing I would have gone with this one, perhaps with some minor changes, like eliminating the small spaces between the drop shadow and the letters. This version is approaching the final one, and has all the design elements in place. And this is the final version. the wide, open letters have been slanted much further, and the drop shadow is now open and a bit further away, filling in some of the open spaces between the letters. OF SUPER-HEROES is heavier, but still a commercial font, I think. This design emphasized the L, usually a good idea, and extends it even further by lining it up with the bottom box. Overall, it’s easy to read and a nice design, as well as a departure from anything that had gone before. Here it is on the cover of the first issue, with negative-like colors giving a startling, almost neon sign effect. 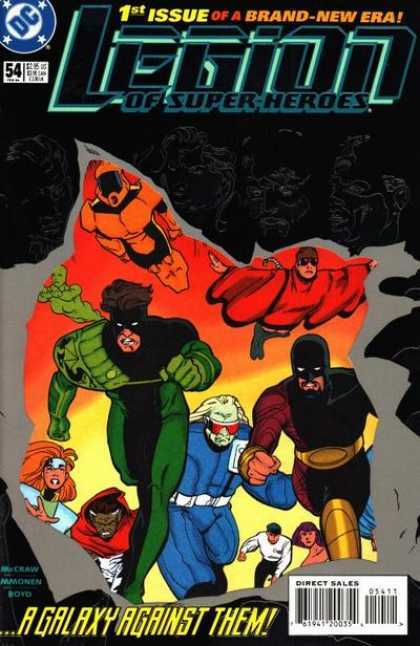 Unfortunately, many Legion fans seemed to dislike this relaunch, but apparently they bought it anyway, and Vance’s logo stayed on the book for several years. Note that DC felt THE NEW had to be added to the logo, as if that wasn’t obvious. 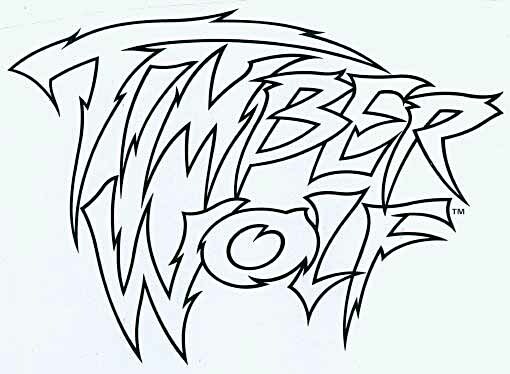 Please give credit to Curtis for the Timber Wolf logo design. He provided two sketches with his notations. He left it up to me to work out the details; the major adjustments were re-spacing the I and M, increasing the width of the M, and altering the curve of the W’s middle stroke. Attached is his second sketch for reference. Thanks, Alex, I appreciate the correction. And I should say that Curtis King had a hand in many of the logos seen here and elsewhere in my logo studies, and probably doesn’t get enough credit, so I’m happy to credit him here. Above is the logo from the DC files. Curtis has gone all the way to create an organic, scratchy, dangerous logo that matches the character’s look and personality. And Alex did a nice job with the final rendering, too. Hard to see on the cover, but there’s a black drop shadow that was probably added by DC. 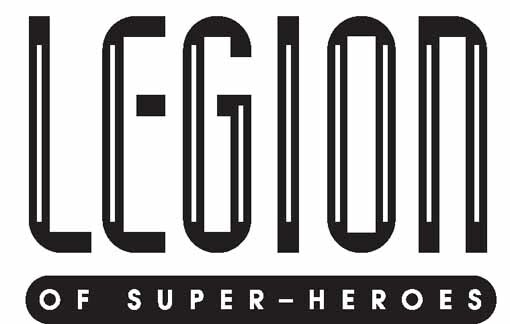 In 1993 a new Legion ongoing series, LEGIONNAIRES, was planned, and I was again asked to submit designs for the logo. The good thing about this assignment was that it distilled the title down to one word. The bad thing: it was a very long word! Only two of my marker sketches survive for this one. I think I was asked to incorporate the legion symbol behind the L, and for the rest, I went with fairly standard block letters and an open drop shadow. Not one of my more creative efforts. Curtis King at DC liked it, though he asked for a taller version, seen here. There’s a small note, hard to see, indicating he wanted the L on top of the E, and my note to him asked if I should produce the oval symbol on a separate layer. I didn’t, so I guess he felt in unnecessary. I did leave small gaps around the letters to make it easier to hold that part in a color if desired. 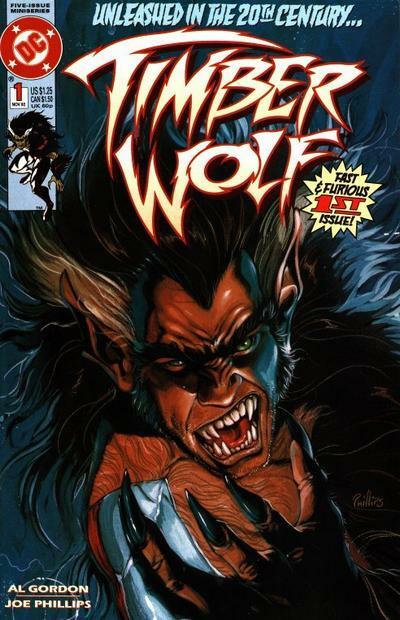 …and the cover of the first issue. Looks okay, if not very exciting or original, and at least leaves lots of room for that great cover art by Chris Sprouse. This series was a light-hearted alternative to the grim stories in the main Legion book, and I have to admit I liked it better. 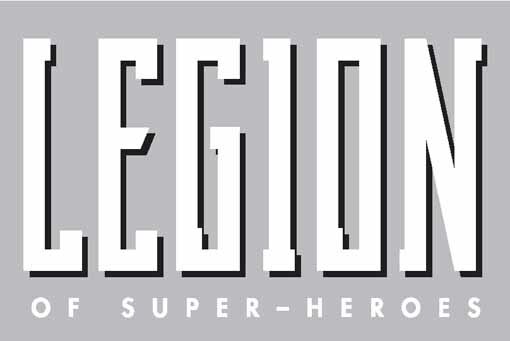 In 1994 DC revamped the main Legion book again, and wanted a new logo for it. The designer was Ken Lopez, who told me that DC had seen some of his logo designs for the 2099 books at Marvel and asked him to take a similar approach for this one. Here’s the original from the DC files. In good contrast to the previous logo, Ken went very angular, and added even more horizontal gaps near the top of EGION, while keeping the L intact for more impact. The second line is still aligned with the bottom of the L, but is now open angular letters slightly on top of the first line. An open drop shadow on the left side helps tie it all together and adds a place for another color. An attractive and futuristic look, this logo remained on the book until it ended in 2000. …then scanned it and produced the final logo on the computer in Adobe Illustrator. 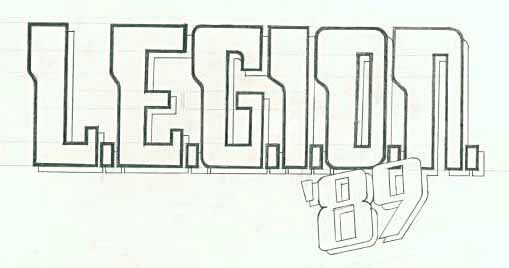 Very retro, and lots of fun to do, I have to say this is my favorite of my own Legion logos. Next time I’ll bring the Legion up to the present in the final part of this study. Other chapters and more logo studies can be found on my LOGO LINKS page. This entry was posted in Logo Studies on October 8, 2009 by Todd. Todd, would you consider doing a book of these features? They’re great. I’ve been asked this a number of times, and my answer is: why? I’m happy having them on my website, I like the traffic they engender, it involves no publishing costs or rights acquisitions, and as soon as I finish one, you can read it. What’s not to like? Yes, I’m not making money, but that’s not my reason for doing them. And, if you’d like to support my efforts, you can always buy something from my site (see my BUY STUFF page, link in the left column). 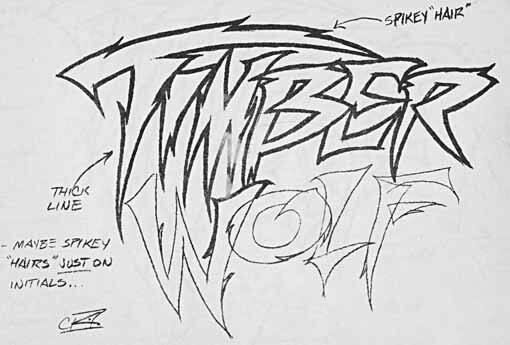 The “Timber Wolf” logo… how often (at the time) did DC change the outline color? Does that technique work without a drop shadow, or should the outline be a four-color black? i can’t answer your questions, Torsten. I wasn’t on staff then. Color holds have been used throughout comics’ history, though. Sometimes it works better than others. I think it works fine on that one. Awwww I’m so glad you included your retro logo, it just makes me happy every time I see it. 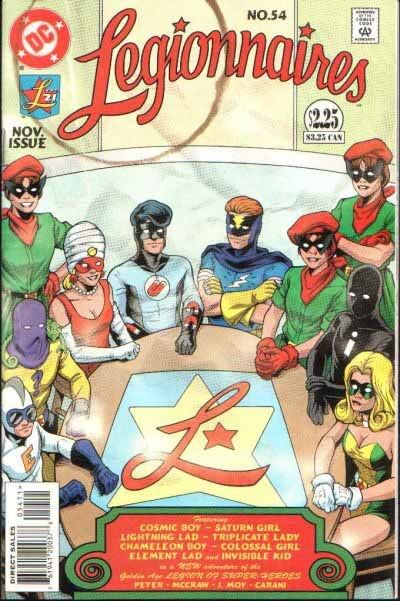 The Giffen/Bierbaum logo is a favourite, so I was sad to see it make way for the Ken Lopez logo, which I found tough to read – still, if that’s what DC asked him for . . .
As always, your logo studies are amazing, even when I don’t read the book. With something like the LSH where I’m an obsessive collector, they’re even more of a treat. Have you ever thought of doing a study of the different logos used on ADVENTURE COMICS itself? You cover part of that in this study, of course, but I think the whole run would be very interesting. Yes, I’ll do that one day. The title, which is the oldest DC comic, began as New Comics in 1935, and the early years would be interesting to study. 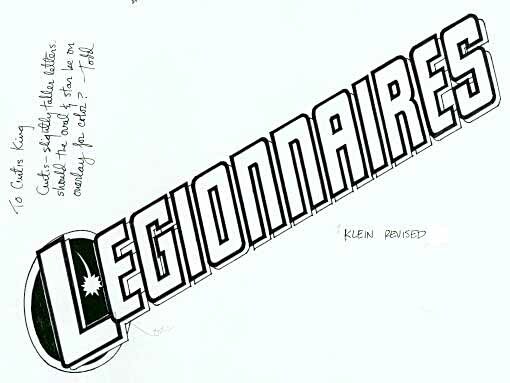 For me, the first logo option for Keith’s Legion would fit much more with the mature tone of the book. Even so, that period had some of the best looking-cover designs by any book of that era. Well, books still last longer than the web, I think. Presumably you’re paying an annual fee to keep this site here. And they make you money of course. You’ve got an important take on a relatively neglected part of comics history and it would be nice to see it preserved for ever. BTW, does Steve Heller of the NY Times ever drop in here? I would think these studies would be right up his alley. Pingback: . 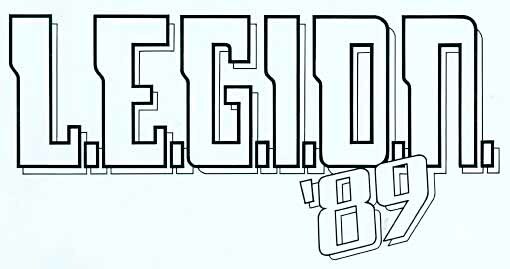 : Glamazonia presenta: LEGIONE DEI SUPER-EROI :.